After a couple of years away, Jeff Scott is back with a new book, which this time is filled with his photography rather than his prose. Produced in collaboration with Rachael Adams, Strictly Shale runs to 186 pages and includes 172 colour photographs. This is essentially a second volume of Shale Britannia that Scott published in 2007. The layout and size this time are landscape rather than portrait, but the general idea is the same. It's a rather random collection of speedway related photographs, described as a "love letter to speedway, its thrills, spills, sense of community and essential Britishness - masquerading as a photography book about the sport". The pictures are of tracks, fans, odd corners of stadiums, track shops and the occasional speedway bike. They were taken by Scott during the years he spent touring the tracks doing research for his collection of speedway books. There are more than a few speedway 'characters' photographed throughout these pages. Riders, promoters, track staff and even the odd well-known supporter make appearances, generally in candid snaps rather than pulling their best pose for the camera. 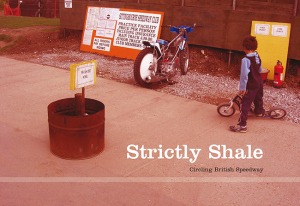 Strangely, this book may actually appeal to non-speedway people more than the die-hard fan. The pictures seem unremarkable to those who frequent the British tracks, but may captivate those who are unfamiliar with the people and places that make up the UK speedway scene. It does have a tendency to concentrate on the slightly 'grubbier' aspects of the sport. We don't see well dressed people having a restaurant meal in one of speedway's better stadiums for instance. It's an interesting book to flick through and it's fun to work out where and when the pictures were taken. In years to come it will be interesting to look back on these photographs and perhaps capturing this era for posterity will be the book's lasting legacy? One difficulty the book may face is its retail price of £15. There will be good reasons why the price has been set at that level, but it may dissuade many from adding this one to their speedway bookshelf.